Adexcel Limited, company number 9148464 registered in England and Wales in 2014, is trading as Adexcel Aesthetics Clinic. The clinic address is Studio 11, 82 Southwark Bridge Road, Southwark, London SE1 0AS. The director of the company is Kafayat Brown, a UK registered Independent Nurse Prescriber. Adexcel Aesthetics Clinic is your one-stop clinic for all your aesthetics needs. Our services include treating the following: signs of aging, appearances of wrinkles, acne scarring, stretch marks and weight-loss, to name a few. In addition to our aesthetics services, we run a travel clinic too offering travel vaccinations and immunisations amongst others. We provide a non-discriminatory and non-judgemental environment by treating all our clients with respect and dignity and uphold confidentiality in a professional manner. Kafayat Brown is a registered member of the Nursing and Midwifery Council, the Aesthetic Practitioner Group, the Cosmetic Dermatology Forum and the Royal College of Nursing. She started her nursing career with a Higher Diploma in Nursing obtained in 2007 from the City University, St Bartholomew School of Nursing and Midwifery, London. She then went on to get a BSc in Nursing in 2010 from Middlesex University. After that, in 2014, she got her advanced diploma in mental health and dual diagnosis. After undertaking her independent prescriber course in 2015 from Buckinghamshire New University, Kafayat became a non-medical Independent Prescriber with a Master’s degree. Kafayat has worked extensively for many health organisations over years since she qualified as a nurse. She started her nursing career in the NHS holding various nursing role, and over the last 3 years, she has worked for one of the biggest private health care and charity organisations in the UK. Due to her interest in Aesthetics, Kafayat decided to start-up Adexcel Aesthetics Clinic in 2017. Since then she has undertaken several courses in aesthetics as part of her Continuing Professional Development. Her training and extensive experience over years enables Kafayat to assess every client holistically, discuss their health issues, expectations and offer advice based on their needs, lifestyle, personal preferences and choices. Kafayat’s main aim is to encourage, empower and educate her clients to look their best and enhance their beauty perception from inside and out. She also specialises in skin care products (both Prescription Only Medicines and non-Prescription Only Medicines), cosmetic & beauty treatment research, anti-ageing and anti-wrinkle treatments, dermal fillers, chemical peels, mesotherapy, Vitamin Infusions, thread vein treatment, skin blemishes removal, Acne treatment, Keloid management and skin pigmentations. Kafayat offers KOC (key opinion consultation) on Glutathione with special interest in Afro-Caribbean, Asian and Caucasian skin. Kafayat is up to date with all her mandatory course like Basic Life Support and Advanced Life support. She is aware of injectable complications/anaphylaxis and is able to reverse complications if they arise. Adexcel Aesthetics Clinic is well equipped and resourced to deal with any of the above mentioned issues. 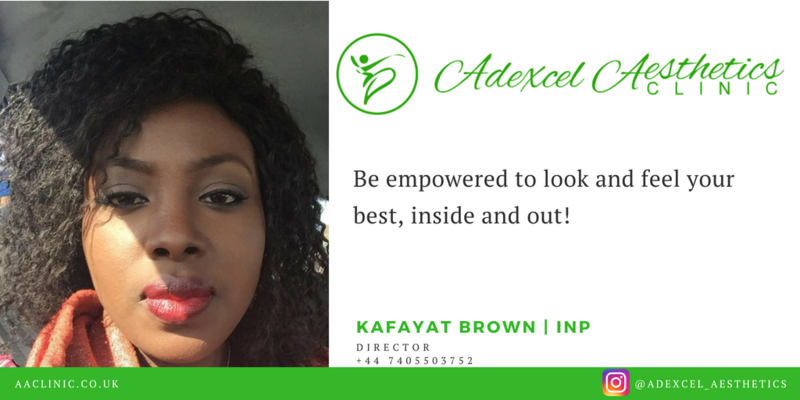 If you would like to speak with Kafayat or find out more about Adexcel Aesthetics Clinic services and products, please visit our Contact Us page.